Thank you for your interest in the Retrofit Assessment Guide! Return on Investment Chart – The Return on Investment Chart is a quick and easy-to-use reference tool that demonstrates the lost revenue associated with the non-value-added time of tooling setup. The chart calculates the annual cost savings by switching to WILA precision quick change tooling using various common hourly burden rates, setups per day, and average setup times. The chart assumes an 80% reduction in setup time by switching to WILA, based on independent studies and customer feedback. Return on Investment Calculator – Utilizing the same concepts as the Return on Investment Chart, the Return on Investment Calculator takes the calculations a step further. By allowing the user to input real world numbers, including cost of principal investment, the ROI Calculator determines the total number of months required for payback, as well as providing projected cost savings over three, five, and ten years. 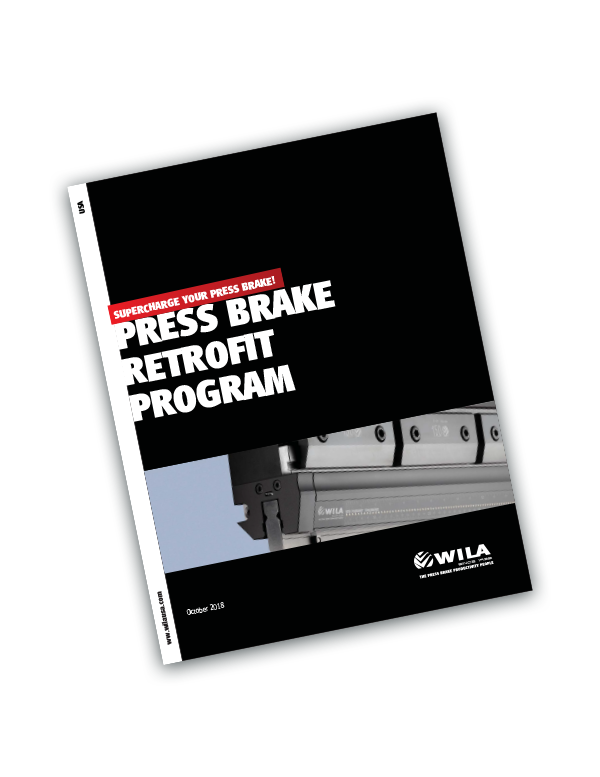 Retrofit Inspection Checklist – The Retrofit Inspection Checklist prompts the user to consider the current state of their press brake, such as physical condition of the press brake; existing press brake features, technology, and capability; available open height of the machine; and ram repeatability. It is to serve as an informal guide for determining the feasibility and practicality of a retrofit for any given machine. Retrofit Stack-Up Calculator – One of the most important factors to consider in determining the feasibility of a retrofit project is the remaining available open height on the machine. The WILA Stack-Up Calculator makes it easy for users to determine their remaining available open height before investing in a retrofit package.